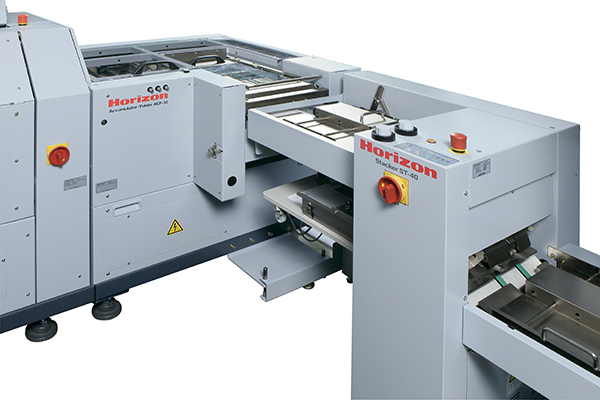 The Standard Horizon StitchLiner 5500 bridges the production gap between existing flat sheet collating/bookletmaking systems and conventional high-volume saddlestitching lines. No signature folding: The StitchLiner eliminates signature folding as offset printed flat-sheet signatures are fed from the VAC collator to produce true saddlestitched booklets with full bleed trimming, at speeds up to 11,000 two-up booklets per hour. Digital verification: The system can also be equipped with the HOF high-speed sheet feeder for digitally collated output (up to 27,000 sheets per hour) with guaranteed document integrity using mark, bar code, or CCD camera verification. Highest quality: Professionally finished booklets up to 200 pages (50 sheets) are fully comparable with booklets produced by traditional saddlestitchers. The HOF-400 is a high speed near-line feeder compatible with a wide variety of system configurations, capable of sheet feeding, cover feeding, accumulating, bleed trimming, and center creasing. 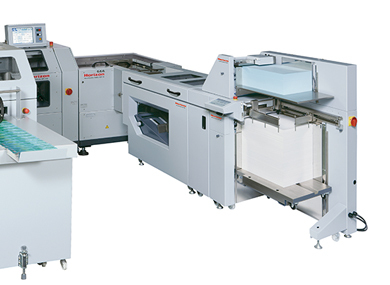 The IM-30 in-line sheet inserter helps maximize booklet production efficiency, and is able to insert single sheets, post cards, and folded sheets into booklets stitched on the StitchLiner. 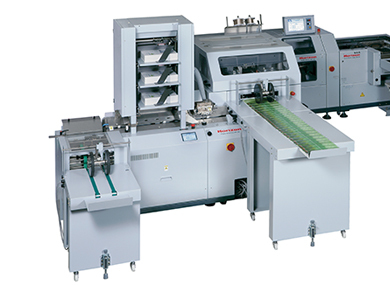 Enabling simple and quick changeover, the ST-40 switches between bookletmaking and stacking at the push of a button.